UPDATE: "[I]t’s worth remembering that “drain the swamp” is not just a hashtag for Trump. It was arguably one of the animating principles of his campaign, one that was embraced by his supporters with an enthusiasm that even surprised the then-candidate." Read the Washington Post, President Trump’s commitment to draining the swamp is being tested. Trump promised "to 'drain the swamp' — to eliminate the culture of self-dealing, conflicts of interest and pay-to-play that has infested government." White House grants ethics waivers to 17 appointees, including four former lobbyists, which noted that the "rate at which the Trump White House has handed out waivers is far faster than that of the Obama administration, which issued 17 exemptions for White House appointees over eight years." How Jared Kushner built a luxury skyscraper using loans meant for job-starved areas. Read also Trump's Big CON: He Won't Be Draining the Swamp, Quite the CONtrary. UPDATE III: "Despite this presence on Wall Street, detailed in previously unreported financial records, Vnesheconombank, or VEB, is no normal bank. It is wholly owned by the Russian state. It is intertwined with Russian intelligence. And the Russian prime minister is, by law, the chairman of its supervisory board. . .
VEB and Mr. Putin are inextricably linked. . . There are other government-controlled banks in Russia, Sberbank and VTB, but they are primarily retail banks. VEB serves a very different role, lending mostly to large borrowers, many of them politically connected. To that end, VEB over the last decade has lent freely in ways that dovetail with government priorities and make it a tool of Russian soft power. The purse strings opened for two influential groups in particular: oligarchs building Olympic sites in Sochi and companies in Russian-speaking eastern Ukraine. 'This is not a bank,' said Karen Vartapetov, a public finance analyst at Standard & Poor’s. 'We should rather treat this bank as a government agency. It is used by the government as a tool to invest in politically and socially important but not always financially viable projects.'" Read The New York Times, Bank at Center of U.S. Inquiry Projects Russian ‘Soft Power’. UPDATE II: Another argument that Trump is just a "useful idiot" to Russia. "The Russian threat is currently inflated: A post-Communist Russia will always be a troublesome rival, but it need not be an eternal enemy, and if our presidents can maintain alliances and forge deals with dictators in Riyadh and Tehran, they can also make deals with the strongman in Moscow. But Trump pretty clearly lacks the gifts required for that kind of deal making, and instead he’s much more likely to be a mark for the Russians, who can use his desire for a kind of super-reset to sow divisions in NATO without offering much of substance in return. So in a strategic sense I am content to have Trump’s desire for détente balked by leaks, probes and the resistance of his military advisers. But his critics should also recognize that all those leaks and all that institutional resistance are also precisely the reasons a neophyte like Jared Kushner might have imagined that the bureaucracy should simply be bypassed, and his father-in-law allowed to hammer out his imagined bargain with Putin man to man. . . Follow the evidence, by all means. But keep in mind that the evidence we have is still perfectly compatible with a presidential candidate and his advisers who made a foreign policy promise in the clear light of democratic debate and set out to keep it with all the wisdom, imagination and experience at their disposal — which is to say, alas, not much." Read The New York Times, The ‘Manchurian’ President? UPDATE: Trump’s son-inlaw had a secret meeting with the chief executive of "Vnesheconombank, known for advancing the strategic interests of Russian President Vladi-mir Putin and for its role in a past U.S. espionage case[,] . . Sergey Gorkov, a graduate of the academy of the Federal Security Service, or FSB, the domestic intelligence arm of the former Soviet KGB, who was appointed by Putin to the post less than a year before his encounter with Kushner. . .
[The bank, also know as VEB, has been] under U.S. sanctions since 2014 . . .
[After the secret meeting, flight data shows that VEB's] jet headed to Japan, where Putin was visiting on Dec. 15 and 16. The news media had reported that Gorkov would join the Russian president there. . .
Officially, VEB is Russia’s state economic development bank, set up to make domestic and foreign investments that will boost the Russian economy. Practically speaking, according to experts, the bank functions as an arm of the Kremlin, boosting Putin’s political priorities. . .
VEB has also been used to promote the Kremlin’s strategic aims abroad, experts say, financing projects across the Eastern bloc. VEB has played a role in Russian espionage efforts in the past, serving as the cover for a Russian operative convicted last year of spying in New York." Read the Washington Post, Explanations for Kushner’s meeting with head of Kremlin-linked bank don’t match up. 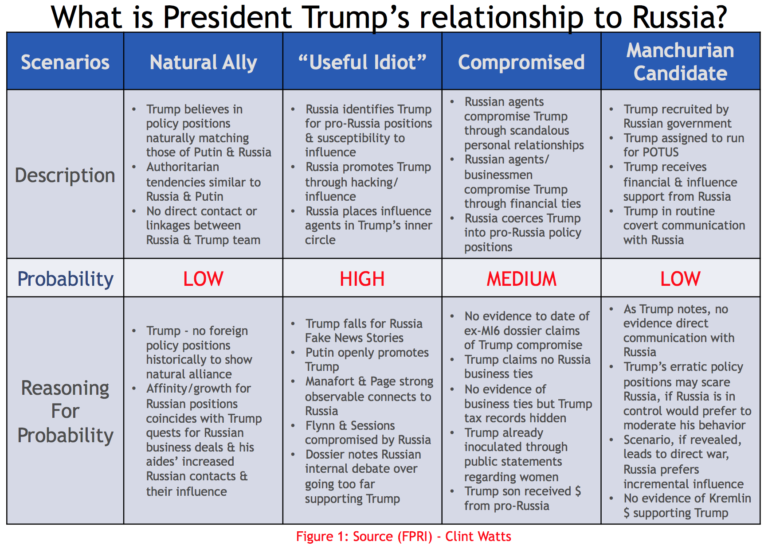 "Former FBI special agent Clint Watts, whose testimony in March laid out the most comprehensive look at the array of tools Russia used to influence our election, has a handy chart that explains a spectrum of individuals who may be of use to Russia’s intelligence services. 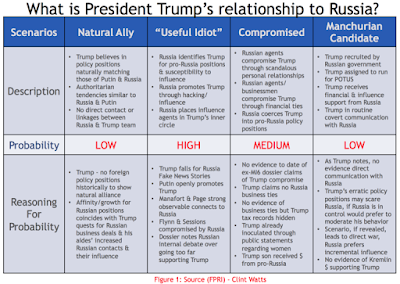 The continuum ranges from 'natural ally' ('Trump’s alignment with nearly every Russian foreign policy objective grew in increments, eerily coinciding with the entrance of key aides and advocates into his campaign, not through his own study') to 'useful idiot' ('Russian intelligence for decades identified and promoted key individuals around the world ripe for manipulation and serving their interests. Trump, similar to emerging alternative right European politicians, spouts populist themes of xenophobia, anti-immigration, and white nationalist pride that naturally bring about a retrenchment of U.S. global influence') to 'compromised' (this would match the latest news leak that Russians thought they had compromising information on Trump’s finances) to 'Manchurian candidate' ('a deliberate plant commanded by the Russian government, aided during the campaign with both a hacking-influence campaign – equipped with key Russian advisors – and funding to help him take the White House'). . .
By whatever means, Russia has reaped unexpected and unparalleled benefits from Trump’s presidency. One can attribute all these individual actions to luck or coincidence, I suppose. But Trump has yet to take a single action nor have a single public interchange that harmed Russia’s interests." Read the Washington Post, Would a spy for Russia be acting any differently?